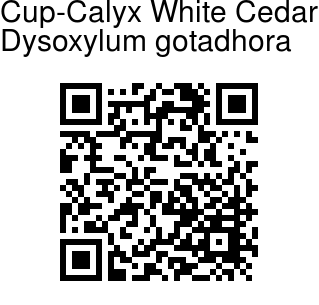 Cup-Calyx White Cedar is a tree 8-20 m tall. Young branches are pubescent or hairless, apical bud spikelike or stiletto-shaped. Leaves are 20-30 cm, even-pinnate; petiole and rachis 4-sided; leaflets 5-11, alternate; petiolules 3-8 mm; leaflet blades oblong, oblong-elliptic, or lanceolate, 8-16(-23) × 4-7(-15) cm, papery to thickly papery, both surfaces glabrous, secondary veins 9-14 on each side of midvein, base oblique and cuneate to ± rounded, apex acuminate (sometimes shortly). Thyrses axillary, much shorter than leaves; short branches pulverulent pubescent. Pedicel 2-4 mm, pulverulent pubescent. Calyx cup-shaped, leathery, pulverulent pubescent, 4-lobed, lobes triangular. Petals 4, yellow, oblong, 6-8 × 2-4 mm, both surfaces pulverulent pubescent. Staminal tube cylindric, free from petals, outside and inside pubescent, mouth 8-lobed; anthers 8, alternate with lobes, oblong, included in staminal tube with only apical tip slightly protruding. Disk cylindric, ± as high as ovary, apex 8-10-crenate. Ovary densely grayish white pubescent; style cylindric, basally grayish white pubescent, apically glabrous; stigma globose to oblate, glabrous. Capsule obovoid, pyriform, or subglobose, 4.5-5 × 3-4 cm, glabrous. Seeds 4, red when mature. Flowering: March-July. 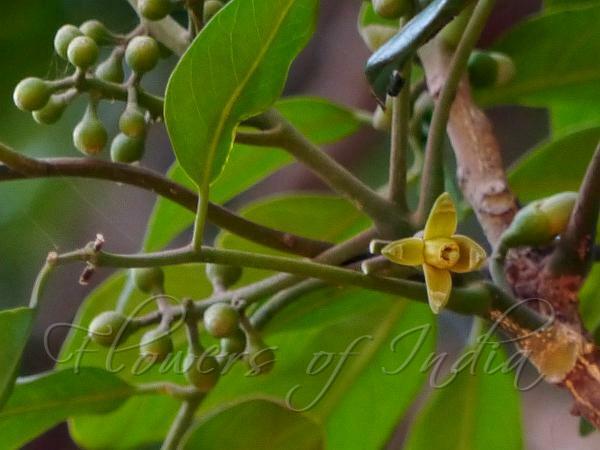 Medicinal uses: The stem bark contains an alkaloid, rohitukine, which exhibits anti-inflammatory and immunomodulatory property.